There’s more investigation into indigo, playing with “rust” and some serious weaving this month. After last month’s “Great Indigo Experiment”, there were still three recipes that Sheila and I were interested in trying. Jane wanted to do a rerun with the zinc/lime vat as she wasn’t happy with the results. So, this month we got together and continued the experiments. In addition to repeating the zinc/lime vat, we tried one that used soda ash instead of caustic soda and one that used a combination. The recipes are again listed. We got good dark results from the first two and reasonable results from the second. The blue, this time around, was much darker. 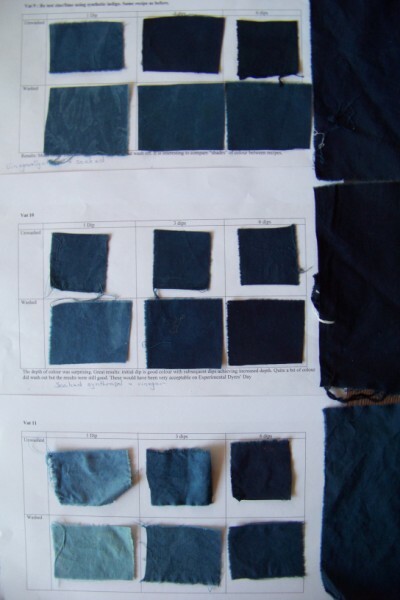 Maybe this was because of more exact measurement, precise temperature control but also because there was not as much being dyed as on the Experimental Dyer’s day. One of the biggest surprises was the great results we got out of the soda ash vat. It produced the deepest blue and the vat also lasted for 3 days. It is also great because it is non toxic as compared to all the others with caustic soda. I also tried a comparison between doing multiple dips on one day and the same number over several. This was one of the advantages of having the vats here. I could spend a lovely few minutes each day dunking. Better results were obtained over an extended time. In all our experiments the dipping time and time between dips (when they were consecutive) were standardised. Top: repeat of zinc/lime vat, middle: recipe 10, bottom: recipe 11. Beside each test result is the deepst blue achieved from each bath. Top: 6 dips with 2 each day over 3 days. Middle: same sequence. Bottom: Unfortunately this bath did not last beyond 2 days so this is the result from 6 dips on day 1. I was having such a lovely time starting out each day with a play activity, that I had another look at rust. (Sometimes I find a quick light hearted play where results aren’t important a great way to start the day and get creativity started.) 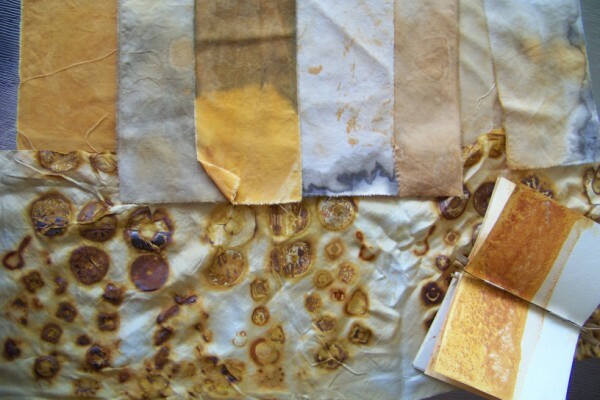 Experimental Dyers this month experimented with “eco dyeing”. One of the activities involved sandwiching plant material and rusty bits between silk and tightly tying it up before boiling. Those results need to sit for a month before being revealed. They are still waiting, but I was reminded of rusty bits. Quite some years ago I did some work on rusting paper. I wanted to use these same recipes and try them on fabric. Because a strong solution of caustic is required, I would only attempt this on cotton. Different sequences produce different results. The results on fabric are not as spectacular as on paper but are still interesting enough. In addition I transferred rust from rusty bits onto silk by sandwiching them between layers of silk, spraying with vinegar and leaving wrapped up for a day or so. Now those results are interesting. I still have plans for trying out an “Indian Black” recipe that uses rusty bits at some stage but that process takes a while. I am excited by a technique I have just been exploring. When I visited West Timor (and that’s on an earlier blog), I collected some textiles. I was intrigued by a number of techniques. This month I analysed a “Sotis” piece and worked out what the threads actually do. 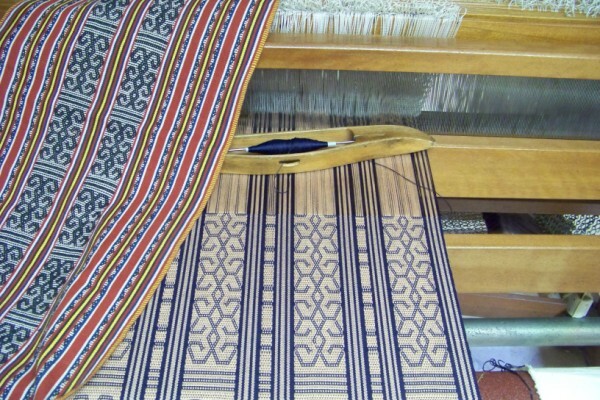 It is in essence a “colour and weave” in plain weave with warp floats. 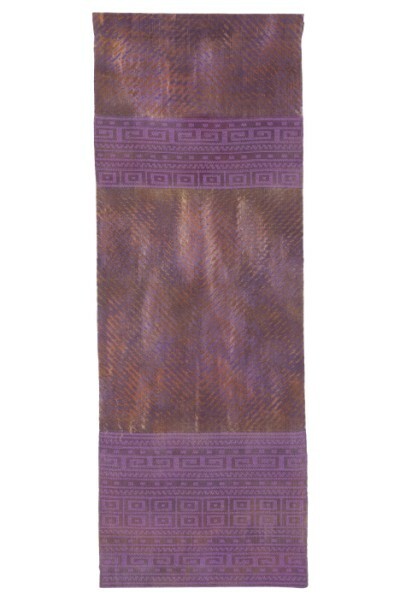 The West Timor weavers do these on a back strap loom with a pick up stick. I, of course, am going to use a loom and make it do the work of a pick up stick. I worked out that my 24 shaft could achieve similar results. Once I experimented with weaving pattern, I considered what design I wanted to focus on. One of the common patterns is a “hook” design. This design is used to represent “linked arms”. In every community, we were always greeted by a formal ceremony where the importance of relationships between us were stressed. 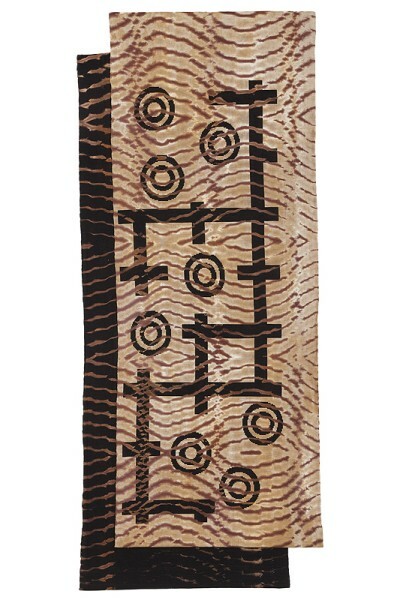 They have a dance where they link arms and this was pointed out as being the same design as in the textiles. So, for me this design has significance and that was what I wanted to use. I have used it though in a different way to how I saw it being used. It was used as a paired motif. I have used it singly, in pairs and as a “string of linked arms”. I particularly like the philosophy behind the long line of linked arms. Back in January I showed a piece of doubleweave in black and white while it was being woven. It is now complete and is no longer black and white. This piece and the following will be in my solo exhibition Line, Angle, Curve in Framed Gallery, Darwin in July. I am weaving a major body of work for the exhibition and am spending very focused time in the studio. You are currently browsing the Kay Faulkner's Blog blog archives for April, 2011.